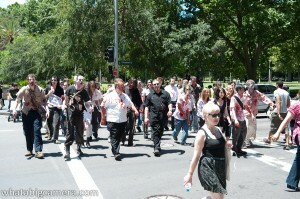 Zombies lurched through Sydney during the weekend to protest the lack of an R18+ rating for video games in Australia. The lurch was organized by Gamers for a proper ratings system in Aus, one of the many facebook groups advocating the introduction of the rating. Earlier this year a R18 “Cosplay for a Cause” Rally that was being organized by Gametraders was canceled amid concerns that the cosplay component would mean the rally would not be taken seriously. You can read more at The Escapist. The Zombie Lurch was also mentioned on Radio SkidRow this evening during The Rack. A weekly show airing on Mondays 6-7pm. The same show that Aaron was interviewed on last week. Thanks to the host Peta for giving our cause some attention! Those who missed out can still attend the Left 4 R18+ Rally scheduled for this coming Saturday the 21st of November. This rally will take place at locations in every state. For further details click here.